Terry's Coach Hire aims to make your experience of booking and travelling by privately chartered coach as easy and simple as possible. With the details of your booking being tailored exactly to your needs, we offer the convenience of travelling from point A to point B at the time you want and with the minimum of fuss. Our Private Hire services are limited to group travel only, with our typical executive coaches seating 49/51 passengers - perfect for Social groups, Larger family groups and Corporate / Business users. Where required, we can plan detailed itineries to suit the individual needs of your group. Additional services we can provide include hotel / restaurant reservations and tickets for theatre shows or events [When booked with coach hire], most requirements can be catered for - Just ask at the time of your enquiry! You are most welcome to visit our office to discuss your booking and choose the coach type most suitable for your journey. Alternatively if your requirements are simpler, please feel free to Contact Us by telephone or e-mail with your enquiry. Our highly experienced staff will attend to your request and provide quotations and pro-forma invoices as required. 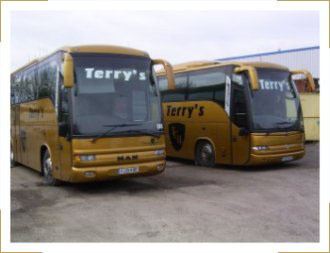 Terrys Coach Hire is not a coach hire booking agent, we operate our own fleet and will only sub-contract to carefully selected quality operators who we are proud to work alongside. You can be rest assured that come the day of your hire a carefully prepared and tailored plan will come to fruition that will confirm private hire coach travel by a well respected and competent operator will both meet and satisfy your expectations.